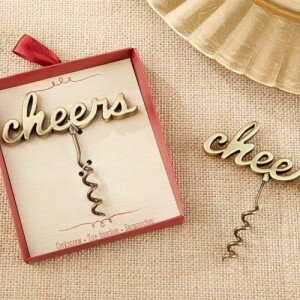 The antique gold “cheers” corkscrew would make an ideal wedding favor any time of year. But it seems even more fun during the holidays for some reason – probably has do to with the color and sentiment! It would be super fun to pair this corkscrew with a bottle of wine from a local vineyard or maybe a cute set of stemless wine glasses. And make sure the bartenders are using the corkscrews so guests get a sneak peek at their fun favor! You can find this fun and festive wedding favor here.